Located at the foot of Tatry Mountains, just 15 minutes walk form the center of Zakopane is a great place to stay for individual and business Guests as well as for organising conferences, workshops and mountain activities. 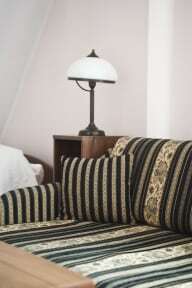 Szarotka Pension is set at the foot of the Tatra mountains. The centre of Zakopane is only 15 minutes walk away and the starting points of mountain routes are also close by. Białego Valley (yellow trail) is situated 3 minutes walk from Szarotka, nestled between slopes of Mount Krokiew and Sarnia Skała, in its upper parts it climbs over to slopes of very Mount Giewont. The stream running along the valley has washed out deep ponds in soft lime rock, and where rock is solid dolomite picturesque waterfalls have been formed. The river bed is mainly white in colour, hence the name of the stream, which translates directly into English as the White. Szarotka Pension offers 17 comfortable rooms including bathroom, TV, radio and teapot; elegant restaurant with bar, stylish fireplace room and fenced parking – all kept in the style of the thirties creating an unique atmosphere. Our friendly staff will always try to accommodate special requests to personalize your stay. The view from the windows is on the breath taking Giewont mountain peak, the most well known mountain in the Tatra range. Those seeking comfort and relaxation are sure to be satisfied thanks to the gorgeous country-side of the Biała river valley. Please feel welcome to spend the evening in front of our stylish fireplace, in our bar in the restaurant all of which are kept in the style of the thirties. Excellent breakfasts served in the form of buffet. Our breakfast offer includes hot dishes. Reception times: 7:00 - 22:00.